Once you bios is setup correctly its time to boot the USB drive. 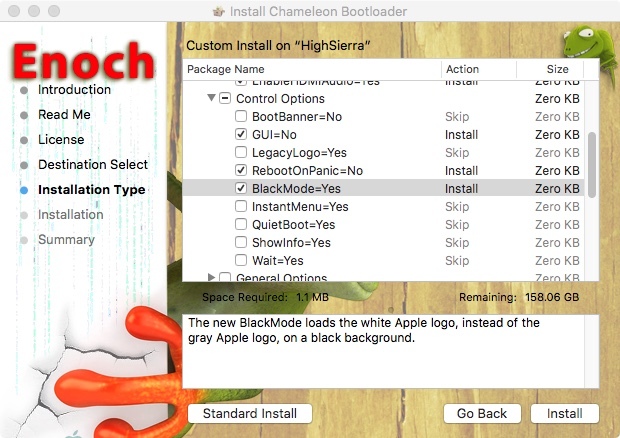 When the Clover menu loads you want to select Boot macOS from SierraAMD to start the install. You'll be in verbose mode so you'll see a lot of text go by, it will hang at gIOScreenLockState for a couple of minutes then load the graphical installer. Click Continue, then Click Continue again to agree to the License Agreement, then click Agree. It will now reboot and we are on to the PostInstall portion. You'll see messages go by, look for errors, when it copies the kexts there will be some verbage not to worry about. Look for messages like could not build prelinkedkernel. Now wait a minute and it will restart or you can click the Apple Menu and choose Restart. Now it's time to boot from the hard drive for the first time. 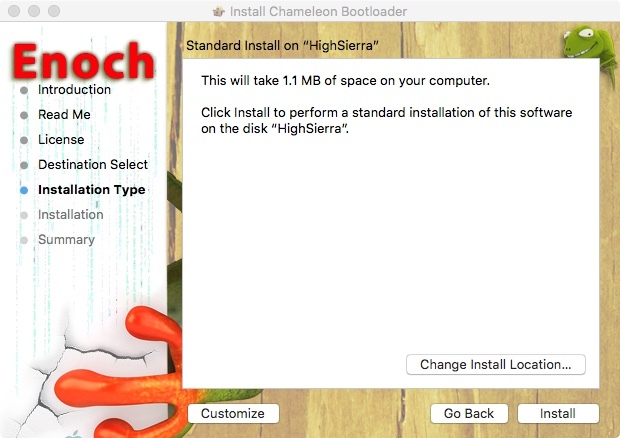 Since there is no boot loader installed you will use the USB Installer to boot. When the Clover menu loads select Boot macOS from macOS and press enter. It will hang for a few minutes at gIOScreenLockState but give it time and the OS will load. Now for the setup. Next it will ask you to setup your User Account, fill out all the fields and click continue. Once the OS loads to the desktop you want to go to Finder from the menu and click on Finder Preferences. Once Preferences loads check the Show Hard Drives box and you'll see your hard drives appear on the right of the screen. Mount the USB drive and from the root of the Enoch files folder launch the enoch installer. 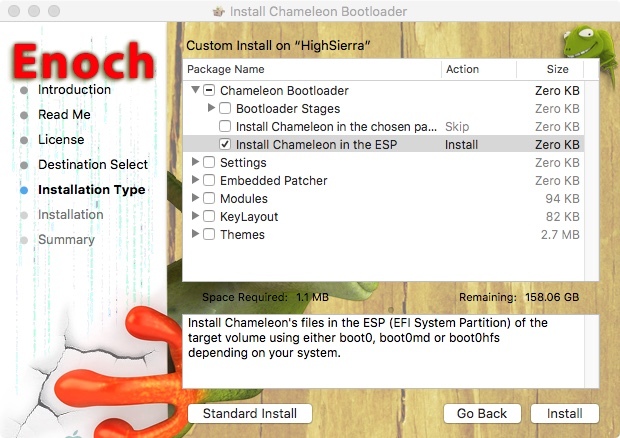 If you have an EFI partition, choose install into the ESP. If you don't have and EFI partition, choose install into the chosen path. Once checked click on install to install Enoch. Once the install is finished copy the Extra folder from the Enoch Files folder over your existing Extra folder to transfer settings. If you have an NVIDIA card and are using web drivers you need to edit the org.chameleon.boot.plist and add NVIDIAWebDrv=Yes to the Kernel flags section. Make a forum post in the proper section with your hardware specs and what problems you are having. If its a kext issue for a piece of hardware we need the manufacturer and the make and model of the hardware to find something for you. Any tips for doing this on a m.2 SSD? I was not able to see my m.2 ..? - Use the command In terminal before installing /selecting drive? It sais comand not found? I look around for it. it's in /usr/sbin I believe, not on a mac to load the disk image to look. One thing to do during install it to do a kextstat from terminal and see if IONVMeFamily.kext is loaded. If it's loaded then the kext edits have been applied to it.